Jason Aldean's "Old Boots, New Dirt" returns to #1 on this week's look at the top of the country charts. 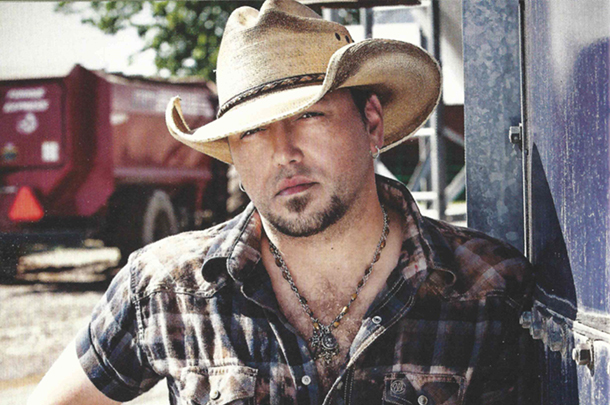 After selling 49k the final week of Christmas, Jason Aldean returns with the first sales report of the new year to #1. Old boots New Dirt managed to sneak past Crash My Party for the #1 slot by around 1,000 albums scanned. Already certified Platinum, Old Boots New Dirt has scanned 772k to date. Luke Bryan's Crash My Party has now scanned 2.34 million copies. at #3 is Carrie Underwood's Greatest Hits: Decade #1. The double disc album is nearly Gold-eligible (double discs= 2 copies 'sold' for each barcode scan). The album has scanned 220k (440k by RIAA Standards). Sam Hunt's Montevallo is at #4 with scans of 228k to date. Garth Brooks' Man Against Machine passed the Gold certification mark last week (though it's likely platinum in the RIAA's eyes from sales to retailers, the # the RIAA Certifies) when the album was the #1 country album with scans of 64k. The album sits at #5 this week with sans of 14k and a total of 532k to date. Speaking of Gold, already certified Gold by the RIAA, Florida Georgia Line's Anything Goes has scanned past that # and now has scanned over 516k albums to date. Eric Church's The Outsiders remains the best-selling country album released in 2014 but it's likely to be surpassed by Jason Aldean and Brantley Gilbert soon (and, eventually, Carrie Underwood's Greatest Hits:Decade #1). Still it has scanned 821k to date. Blake Shelton's Bringing Back The Sunshine has scanned 290k to date while George Strait's The Cowboy Rides Away: Live has scanned 285k (many of them exclusive Walmart deluxe editions with the video filmed of that concert. The video is likely soon to be certified Gold). Rounding out the Top 10 is Taylor Swift's RED. The album has scanned 4.133 million to date. Her current album 1989 has scanned well over 2 million albums to date as well and is the best-selling album in 2014 (released in or otherwise, surpassing the soundtrack from Disney's Frozen). Brantley Gilbert leads The Next 5 with Just As I Am, the talented superstar's third album. He's scanned 713k to date. Miranda Lambert's Platinum is well on its way to, well, Platinum with sales over 606k to date. Kenny Chensey's "The Big Revival" has scanned 321k to date while Florida Georgia Line's Here's To The Good Times has scanned 2.142 million copies to date. Tim McGraw rounds out the Next Five with Sundown Heaven Town. The album has scanned 217k to date. Some notables include Sturgill Simpson's Metamodern Sounds In Country Music scanning nearly 82k copies to date (without much, if any, radio airplay but massive critical acclaim -- including ours --), Garth Brooks' The ultimate Hits re-issue getting to nearly 111k in copies sold this fall. The album's already certified multi-platinum so these sales numbers are only added onto that. it's just for SoundScan purposes, the album has a new barcode which the 111k are attributed to. Brantley Gilbert's Halfway To Heaven has now scanned nearly 1.1 million while Keith Urban's Fuse is nearly 427k scanned (and nearly Gold too). Finally, How Country Feels from Randy Houser is at 228k scanned to date. The most recent albums from Scotty McCreery, Cassadee Pope and Danielle Bradbery were not on the sales chart this week so we do not have those numbers. In other news, three catalog titles from Jason Aldean made our SoundScan source chart. His self-titled album has now scanned 1.60 million copies according to SoundScan while Night Train is at 1.75 million and My Kinda Party is at 3.13 million scanned. Miranda Lambert Revolution is at 1.75 Million and Zac Brown Band's The Foundation is at 3.37 million scanned to date. Thank you for reading our charts every week! We hope you have had a great holiday season and have a wonderful 2015! Top 5 Country Album Chart Numbers rounded to nearest thousand.